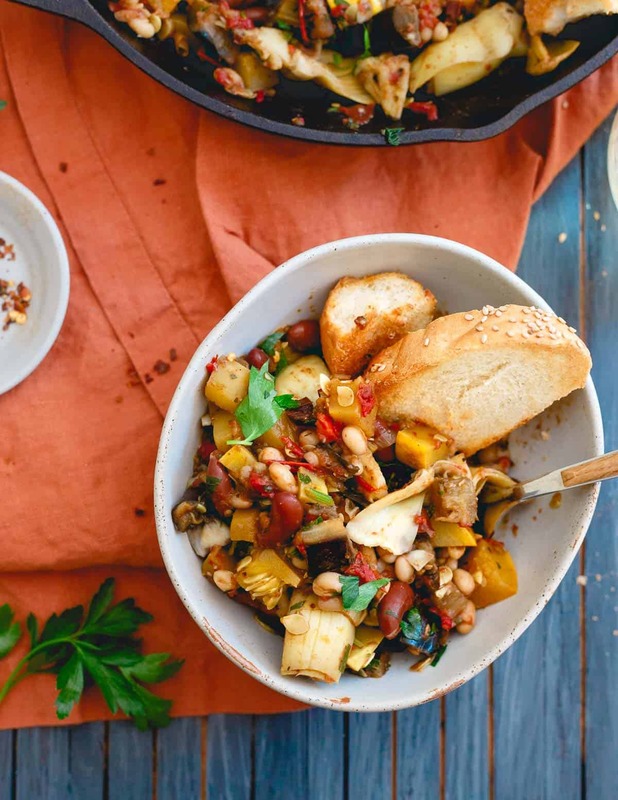 This vegetable bean skillet is packed with all the delicious end of summer garden vegetables and given a hearty, protein boost from two kinds of beans for an easy meatless meal. *This recipe for Summer Vegetable Bean Skillet is sponsored by USA Pulses & Pulse Canada, a 2017 partner of Running to the Kitchen. I feel like I’m being pulled apart in two very opposite directions lately, culinarily speaking. 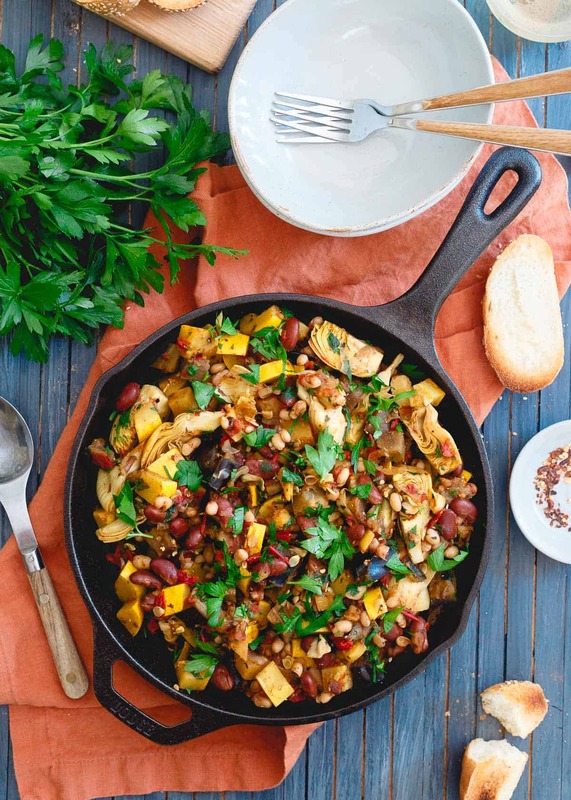 A cloudy cool day comes along and I’m craving hearty fall recipes like this chicken apple cheddar chili or this pumpkin tortilla casserole but then a cool morning gives way to clear sunny skies and a warm breeze and I’m like hold up, there’s still so much good end of summer produce to enjoy! I’m trying not to give into the fleeting feelings of the former because come January when we’re in the middle of a barren, brown, freezing winter and the taste of ripe summer tomatoes feels like it was a million years ago, I know I’ll regret not having eaten as many of them as possible right now. Which is how this end of summer vegetable bean skillet came to be. I’m gonna be honest with you, this whole “meatless Monday” trend is never something I really ever got on board with. I like meat. 99% of the time, I miss it in vegetarian dishes. This is not to say I don’t love vegetables or all the pulses (aka: beans, chickpeas, lentils, split peas) and grains that are its usual stand-in, I just like meat WITH these things. This vegetable bean skillet though is that 1% of the time I don’t mind the absence of animal protein. It celebrates everything delicious about the end of summer and it does so in a hearty, filling way you crave from meals right at the precipice of the fall season. Much like the lentil bolognese recipe from last month, I used pulses in this dish in the form of cooked canned beans to create that filling feeling in each portion. With two different kinds of beans (cannellini <– my favorite bean of them all and light red kidney beans) each serving in this end of summer vegetable bean skillet is packed with 1/2 cup of beans. It’s a great recipe to help you in the Half-Cup Habit challenge and a really easy way to get in some added nutrients, fiber and protein. 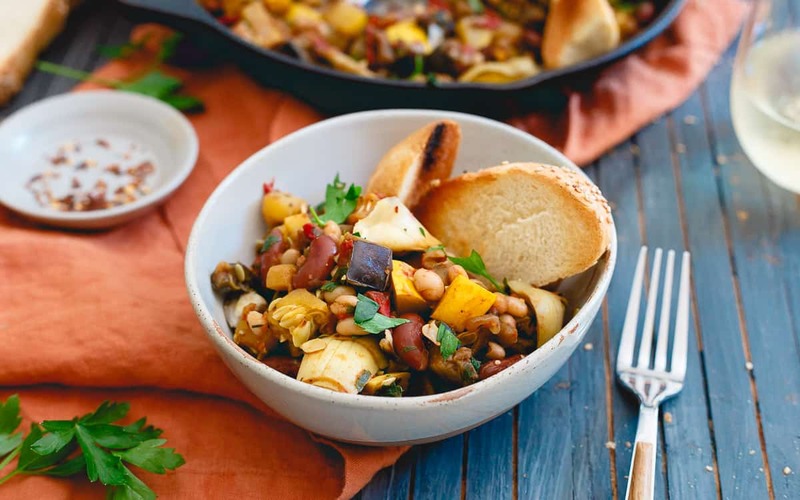 In fact, I think it’s the respectable protein and fiber from the beans paired with the volume of filling summer squash, eggplant and artichokes in this recipe that does wonders to keep you feeling satisfied without the need for meat. 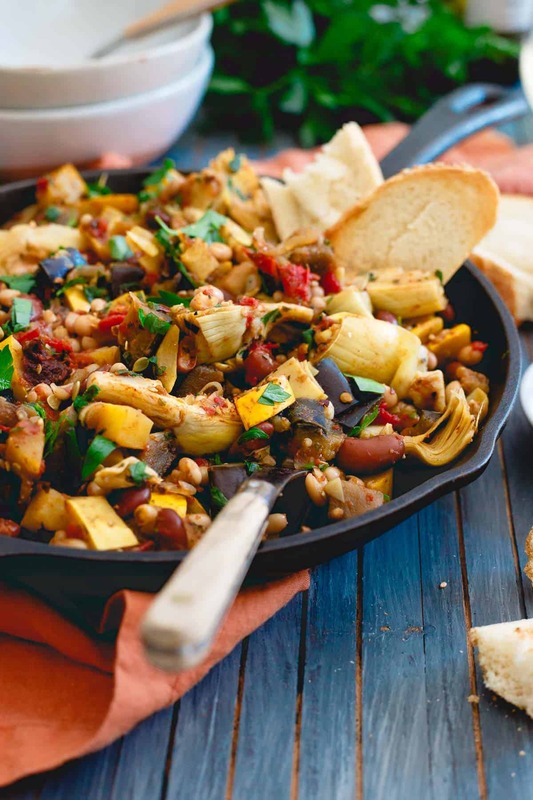 Love this vegetable bean skillet recipe? 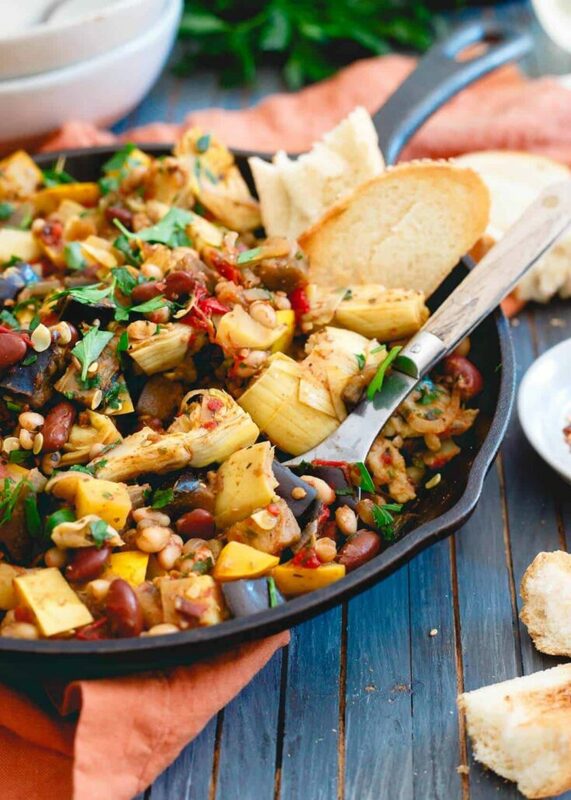 This vegetable bean skillet is packed with all the delicious end of summer garden vegetables and given a hearty, protein boost from two kinds of beans. Add eggplant to the skillet and cook until slightly softened, about 5 minutes. Add the squash and shallots, stir, cover the skillet to create steam while cooking for another 5 minutes. Remove lid from the skillet, add the garlic, tomatoes and sun-dried tomatoes and cook an additional 3-5 minutes. Add the beans, artichokes, herbs and spices, stir to combine, cover the skillet and cook for 10 minutes. Remove the lid season to taste and serve with bread and fresh parsley. As a new vegetarian, this sounds amazing!!! I’m on the hunt for dishes that look satisfying without meat, this one fits the bill!! Love how this comes together so quickly and is packed with so much goodness! My ideal meal!! Looks amazing!! I’m with you about feeling torn towards the seasons changing. I love summer but I’m over the extreme heat. However, once the rainy season starts, I’ll miss not seeing the sun for months. That being said, I love combining fall and summer flavors and your recipe hits the mark! It looks amazing! I love meals like this. Allllll the veggies. Hi Barbara – what do you mean? What are you trying to sign up for? Email subscription? If so, what’s the problem? Love this one using as much of goodness as possible ! Thank you. Beautiful, simple and tasteful ! Thank you !